Egypt: Abydos, originally uploaded by Brooklyn Museum. My name is Stuart Edgar and I have just started the MET TBDL program. In addition to taking this course I am also currently taking ETEC 512. I’ve started this course late, just joining this week. For the past eight years I have been teaching philosophy at a university level, at first with the University of North Dakota and the University of Minnesota, and more recently with Athabasca University. I completed my PhD in philosophy from the University of Calgary last year. I’m particularly interested in ETEC 540 as I have always been fascinated by the relation between languages and worldviews. Hi: My name is Bev. I am currently on leave from my job teaching math in a jr/sr high in a small rural school in southern Alberta. This is one of my 5th , 6th and 7th courses. I am fascinated by the topic- so expect this will be a rewarding course. I have been travelling in Peru for the last month as so am a bit behind!! I look forward to working with you all. ebooks kindle amazon, originally uploaded by libraryman. I chose this image because it features the Kindle (a digital book reader) which combines two of the key preoccupations of the course: text and technology. 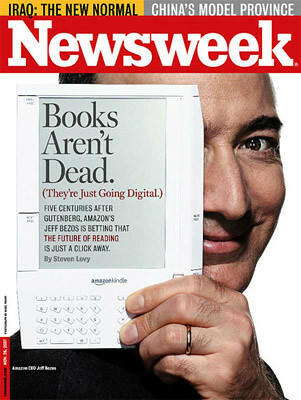 Discussions about the Kindle were briefly the rage among technophiles at my school, until it became apparent that, at least initially, the device would only be available in the U.S.
I’m Phil, a teacher-librarian and journalism teacher at Centennial School in Coquitlam, B.C. I’m in my 10th year as full-time secondary teacher, after seven years in the Canadian newspaper business. My last newspaper job was working as a copy editor at the Toronto Star. I was born in Vancouver and raised in the Okanagan, so it didn’t take long before the desire to come home set in. I had moved to Ottawa to do a master’s in journalism at Carleton, and it was there, working as a TA in Journalism 100, that I started thinking about teaching as a career. A bleak Toronto winter sealed the deal. After earning my BEd at UBC, I started teaching English and journalism. At Centennial, the teacher-librarian asked if I would be interested in taking a library block to help with Internet and digital (then CD-based) resources, and in the years that followed I slowly picked up library blocks and dropped the English classes. I wasn’t too interested in pursuing an MEd in teacher-librarianship until recently when it became apparent that the role of technology was being more closely examined by TLs. I’m an early adopter, but also a skeptic. Technology is costly for schools and many of its affordances and non-monetary costs are poorly understood. As Postman pointed out in the Technopoly excerpt (which I confess I read from my print copy rather than the PDF), there are costs as well as benefits in all technologies. It seems the school community is populated with technophiles and technophobes, and an insufficient number of people willing to inhabit the murkier middle ground. This will by the final course in my program and I am looking forward to it. However, I was waitlisted and just given access last week, so my first task is to catch up with the rest of the class! Luhrs Library, originally uploaded by ShipLibrary. Trying to catch up on Module 1. Sorry for the late post. I chose this photo as it represents my reality with text and technology in the classroom. We have classroom labs of 15 computers, as well as a mobile wireless cart in our schools. One of the constant issues is the appropriate and effective integration of information technology into the curriculum and instructional practises. I am currently working in my fifth year as a K-12 Special Assignment teacher for St. Clair Catholic DSB in Southern Ontario. My previous classroom experience has been mostly at the grade 7/8 level. This is my 4th course in the MET program. Among the many hats I wear in this role, I work closely with the District Literacy and Numeracy team of teachers in my board, as well e-Learning. My interest in this course stems from bridging that digital divide to transform teaching practises to include more digital literacies and electronic forms. 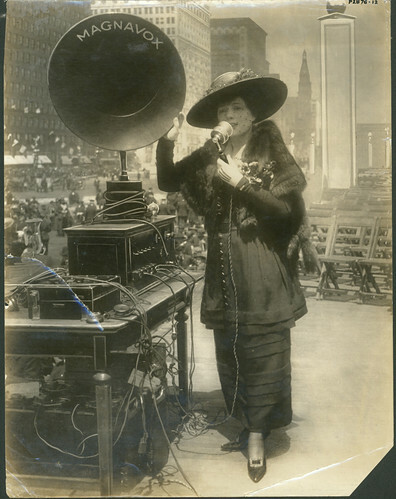 Fritzi Scheff demonstrating Magnavox for Fifth Liberty Loan in New York City, 1895, originally uploaded by Powerhouse Museum Collection. “New” technology is being shown off here in the photo. I selected a musical theme since music is termed the “universal language” and technology has provided a way for us to weave music into our life in a way that had never been possible. With high capacity portable players, we can immerse ourselves in our favourite tunes anywhere anytime. it is posited that so many songs have now been penned that the combinations of notes for a musical flow have been exhausted if one considers songs from all ages, all places. That is amazing to me. The technology of music has blossomed in a way that allows us to hear a beautiful symphony without travel, the chants and drums of African and other world music at the flip of a key, and to record our own music using simple add-on technology for our computers. Current home studio products exceed the multitrack capacities of the recording studios used by the Beatles. The proliferation of online distribution channels has revolutionized distribution. The whole system surrounding music has significantly changed in the short history of recording. The sophistication of the tools as well. That is what appears to me to be the meaning of technology–both system and tools. The dictionary definitions I reviewed in OED and elsewhere are interesting from an etymologic perspective indeed but for simplicity, system and tools describes technology surrounding music. Curiosity….. what are they reading?, originally uploaded by Tom@HK. Whenever I come across the word, for some reason it brings to my mind the opposite. 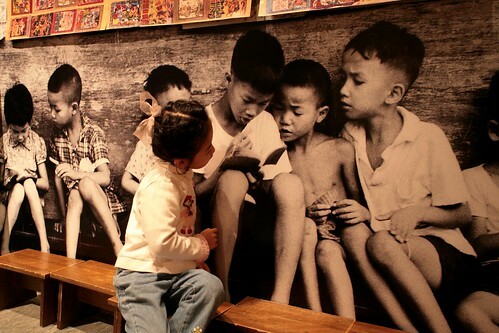 I always envision children who are deprived of formal education. Children who would love to be able to read and write, but can’t due to poverty or political unrest in their countries. I live in Turkey where, in many small schools spread out in the eastern region, a book is a priceless object. Children read the same book over and over again just to satisfy their quench for discovering something new and different. It is a very common occurence where illeterate elderly women, who were denied an education during childhood, complete literacy courses provided by the state. The joy on their faces when they are able to read the signs on the walls, the boards indicating the destination on the buses and any form of text is something to be seen. It must be a great thing to not have to make up a lie such as: “My eyesight is impaired, could you please read this for me?” when you know that it’s obvious that there’s nothing wrong with your eyesight. I’m an EFL teacher living and teaching in Izmir, located on the Aegean coast of Turkey. I work in one of the top-notch, private primary schools. My third grade students love reading books in the native language, but prefer listening to an English book read to them with animation. I’m interested in this course from the literacy in second language perspective. I hope that the knowledge I gain from this course will help me to blend literacy and technology in the same melting pot. plate 1, originally uploaded by Skabob11. Hi everyone! I’m Danielle, arriving a little late (from Fort Langley – I blame our very infrequent bus service) – and trying to figure out where everything is and get caught up. I chose this photo because I love to work with clay, and one of my recent project ideas involves combining clay and metal type. So far I have experimented only with using type to make imprints in clay – sometimes to create words, and sometimes to create “non-words”. For example one of my fonts makes lovely fruit (capital O) and leaves (&) strung along a vine. I like the way that blurs the boundaries between word and image. 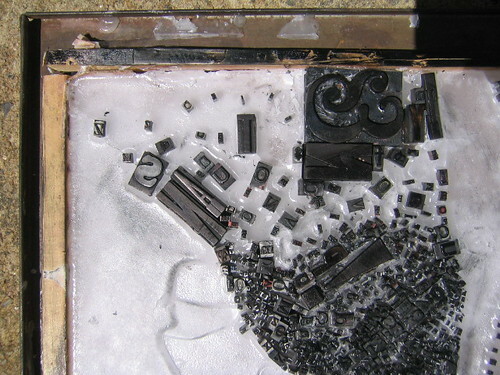 Some day I may also play with incorporating the type itself into the clay – though I’m not sure what will happen when I fire it, and not sure I can bring myself to sacrifice any of my precious type to find out! I am also very interested by the effect ‘writing’ in clay has on my relationship to words… I pick them very carefully (and frugally) when they will last for so long and lend their spirit to the character of the piece. What do these words mean, invoke, evoke… how might that be different for me than for someone else? Okay, enough of that… me, and my interest in the course: I’m a SCPE student, in my first semester… have worked in post-secondary education (staff/admin) for 16 years… taking this course because I am very interested in how medium affects use of language, and also because much of my work in Institutional Research involves trying to get people to engage with me in writing (online, on paper) to tell me things I need to know. texting, originally uploaded by natgibso. “Don’t spend too much time wandering in the Commons: it can be an amazing place in which to get lost!” (Module 1, instructions for Flickr activity). I got lost anyway. For days I searched for the image that I thought would be indicative of the issues relating to the course, until it hit me. Literally. Studying, originally uploaded by etec540’s photos. I like this picture ! 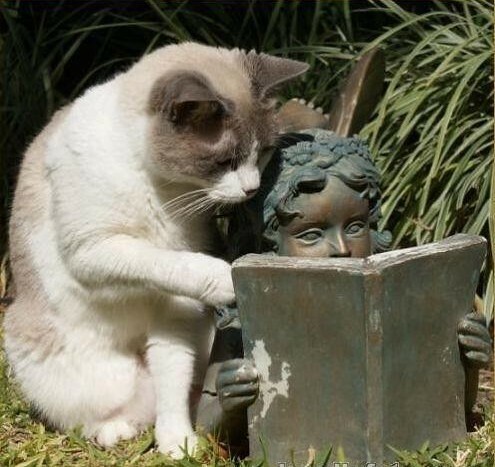 It seems that the statue is reading deeply, whereas the cat has just a rapid look and wants to turn the page. Maybe the cat doesn’t like reading in a classical approach (book) in compare with peace and serenity of the statue in its reading. Maybe the cat prefers using new technologies in reading whereas the statue is faithful to that antique book ! But I feel a sense of cooperation/coordination between them, instead of a conflict. I think, that should be the aim of any education program in a society composed of different groups/people. My name is Hosein Moeini. I’m a new comer to Canada. I came to live in Vancouver, 80 days ago. Therefore this is my first semester in MET. It is difficult when people move from one apartment to another. It is much more difficult when you move to another city, another country and another continent ! I was teaching in the university before coming here. I received B.S. and M.S. in industrial eng. and I worked for several years as a system programmer. Then I started Ph.D. in computer and educational technologies. Later, I changed my job and worked as an instructional designer for three years and then a university instructor when I received Ph.d. The courses I taught were designing web-based course materials, web programming and Java (my favorite language !). lack of Canadian experience is a big problem for new immigrants to find a job. My Canadian experience is just limited to articles that I presented in E-learn and Ed-Media conferences in 2005, 2007 in Vancouver. (Also an article in E-learn 2009, in October). I’m sure I’ll learn a lot from this course and my colleagues when we exchange our ideas and talk. ETEC 540, originally uploaded by livingkatstone. Peggy French’s confession: This is a carry-over from my vacation quest to find everyday objects in the shapes of letters so I may spell words and frame for Christmas gifts. But really, I did also relax during my vacation! I used a mashup where you spell and Flickr photos are nabbed represent your word. I went with curiosity and knowledge for their integrated power and interdependence. It’s also something I see missing from the majority of the student population at my institution. There seems to be a lack of curiosity and a preference for information over knowledge (a.k.a. the answer the instructor wants vs. creative interpretation and/or the path to more questions). It may be a tactic to harness the information overload they feel or a reaction to the often superficial ways in which we dip into information these days through multi-tasking or using the first half screen of a Google results list. I admit, I also appreciate the symmetry of equally-lettered words! Most recently, I’ve become heavily involved in our organization’s new learning management system, Desire2Learn. Therefore, developing a greater understanding of educational technology is imperative as my organization moves more from web-facilitated to blended or online courses. I plan to pick all brains especially those with more experience designing and delivering content in an online environment. Here’s to a successful semester! 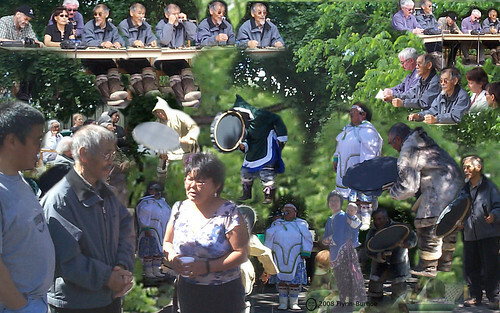 Mariano Aupilardjuk, Pond Inlet Drum Dancers at Larga, originally uploaded by ocean.flynn. This picture is about an elder (Mariano Aupilardjuk) from Pond Inlet, Nunavut. He was honored for his work with the youth in his community and for his contributions to his people in general. I have spent the last nine years working and exploring Canada’s north. The only province/territory I have left to visit is Nunavut. Oral tradition is still very important to Canada’s indigenous people. My name is Bruce Spencer. I am the Training Coordinator for De Beers Canada. I’m currently living in Yellowknife, NT and I work at Snap Lake Mine, a remote diamond mine 220 km northeast of Yellowknife. I work a four and three rotation, meaning I only work four days. I fly to the mine site Monday morning and return Thursday afternoon. My job involves a multitude of things – everything from scheduling training courses to maintaining the LMS. I work with a team of four others in providing support to all of our employees, many of whom are of first nations decent. I teach whenever I can. I am certified to train employees in Confined Space, Fall Protection and First Aid. I teach computer related courses (basic computer skills, various software products, etc.) and I provide basic educational training (literacy and numeracy skills, GED, ADLC, trades exam preparation, and so on) when time permits. ETEC 540 is my seventh MET course. I have been an educator since 1984 and only just recently made the switch from teaching school age children to adults. I am looking forward to exchanging ideas, stories and even a laugh or two with you all, over the course of the next several months. Morgendämmerung, originally uploaded by hailewelt. Hello, my name is Stephanie Hopkins (I was Prizeman last semester), and this semester I am taking my 5th and 6th MET courses. I am from Victoria, BC, but now call Port Alberni home. I teach grade 7 and 8, I am married with one child, and I am afraid of airplanes. I chose this image not only for its “frightening” beauty, but also the thoughts and feelings it evoked for me. 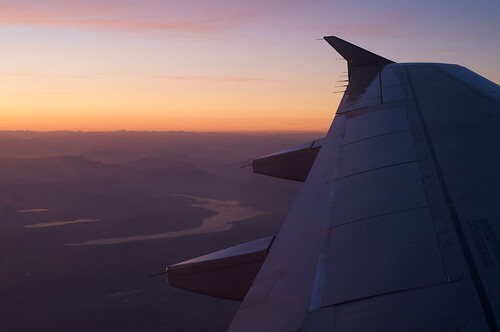 The idea of air travel and aircraft in general is a mind-boggling and frightening thought to me, but is also one of the most important (for both positive and negative reasons) technologies in our history as humans. As various technologies propel humankind into the future, I worry about the effects that these new and improve technologies wil have on us. The simple beauty of the sunset and landscape in the photo is a reminder of where we have come from, and what we have to lose if we are not careful. The juxtaposition of the two ideas in this photograph compels me to think about the future and what my feelings are on where we are going as humans. I am far from a technophobe, in fact, like others on this forum, I too cannot seem to function without my email with me at all times, but I am becoming increasingly aware that if I do not have balance of chaos and simplicity in my life, then I will create problems for myself and my family. Text and it’s technological roots. 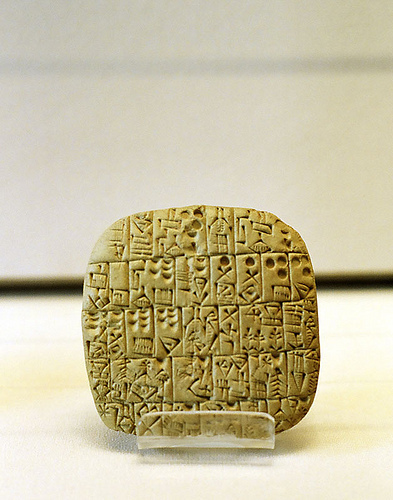 One of the earliest forms of writing to be developed came out of ancient Sumeria approximately in the 30th century BC. They made use of standardized punches and clay tablets as a way to keep track of trade and the bounty from early agrarian culture. So when asked to contemplate text and technology my mind first jumped to “when it all began”. The development of early writing systems as well as the independent development of the written word at various times in the past has always been a source of fascination for me. In Jerrod Diamond’s book, “Guns, Germs and Steel”, he touches on the development of early language, specifically how the written word was discovered independently by various different cultures around the world, specifically what is now Iraq, Egypt, China and southern Mexico/Guatemala. As we quickly approach 2010 I am amazed at the rapidly developing use of text in the digital age. In particular I find the movement towards collaborative writing (both software and conventional language) as seen in the open source and wiki movements as being particularly exciting. My name is Richard Biel and I work at the Sunshine Coast Alternative School. I teach the humanities in a blended learning environment to students ranging in age from 15-19. I team teach with a gentleman that has been using Learning Management Systems and computer based technology and alternative text formats since 1994!!! Boekdrukkerij in Amsterdam, originally uploaded by Nationaal Archief. 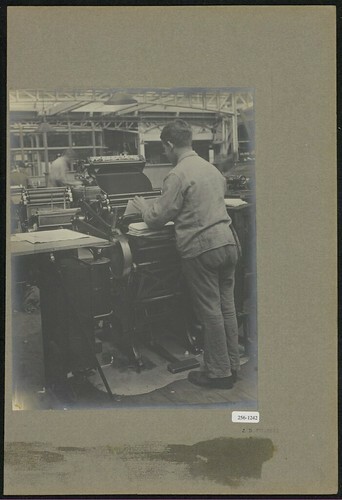 I selected an image of a man loading presumably paper into a printing press because of the historical implications of the printing press. For me the printing press represents the connections and contacts between cultures, having been invented in China and transferred to Europe. This represents the communications of ideas through text that in turn help to mass produce other ideas for distributions. Personally the press also symbolizes the ability for certain members of a society to control the messages that are distributed and consumed by the rest of society. Lastly, I selected the image because I cannot read the text that accompanies it. It is in a language which I do not read, thus symbols that are recognizable to me but an norganization that is alien. My name is Noah Burdett and I live and work in Vancouver BC. I am currently a grade one french immersion teacher with the Vancouver school district. As I work with students that are discovering texts and beginning to make meaning of texts I am extremely interested in its history and its future. I look forward to collaborating within the 540 community. 2005 Powwow, originally uploaded by Smithsonian Institution. 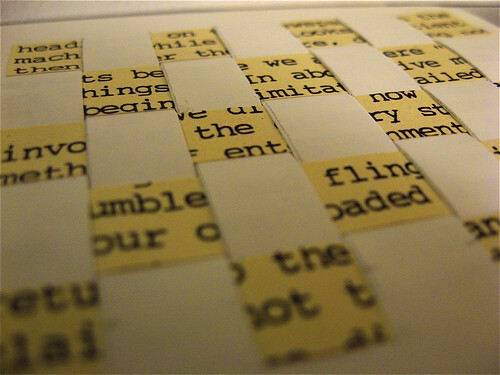 I chose this picture to illustrate my vision of text technology due to its multidimensional qualities. 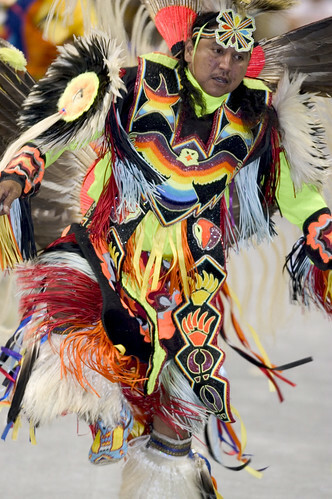 This photograph depicts a man from an indigenous culture during a ceremonial dance. The dance denotes the Greek origins of the word “text”, reflecting the concept of creation and creativity. The dance and the apparent chanting or singing of the man reflects the Latin period of the word, the weaving together of verbal construct. The colorful and varied materials in the clothing of the man emphasize the blending of oral and written constructs as well as the merging of text with technology as society utilizes various tools to enable the recording of sounds/ideas into diverse written formats. I am Liz Hood and I am a media specialist in Rock Hill, SC USA. (I believe we are called teacher-librarians in Canada). I currently serve in an IB-MYP school. Through taking this course, I am hoping to gain an understanding of the evolution of text technologies and how to best prepare both students and teachers for emerging text and technological spaces. While I am currently involved in K-12 education, my goal with MET is to move to training educators in the best implementation of technology within their specific curriculum area. I have completed 6 MET classes thus far and plan to graduate in May 2010. Naval Signal Flag Alphabet, originally uploaded by ibdesignsusa. My name is Laurie Trepanier and this is my eighth class in the MET program. I am hoping to complete all degree requirements by April, but this may be difficult as I have just completed a move from Borden, Ontario to Cold Lake, Alberta. While the move was not very difficult, my new job is becoming a little more hectic each day. For those who I have not yet had the pleasure to meet, I am a Training Development Officer in the Canadian Forces (CF). My job while in Borden was to instruct CF members on the Systems Approach to Training (SAT) used in our system and to assist tradespersons to become instructors within our schools. My new job is to advise Command on the acquisition of training technologies (simulators, software, etc) and to oversee the training of the technicians who maintain the CF-188 Fighter Jet (Hornet). The technical background that I require to be effective in my new job leads me to spend many nights reading information concerning airworthiness, safety systems, weapons, airframe structure and electronic systems and sub-systems. Thus my dream of completing two courses this semester has been placed on hold. Being a Navy gal, the picture I have selected is very significant to both my military career and my idea of communications, text and technology. While the signal flags are considered old, it is just as effective in both military and civilian marine operations today as it was in the time of Nelson. 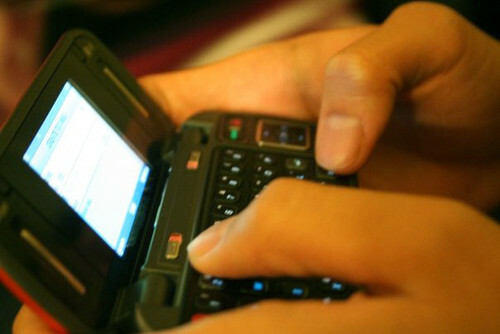 My opinion of technology is basic; is not just a computer or a PDA. To me, it is a means of communications – regardless of the age of the tool. Text is what results when technology is used. Technology is the tool; it is the object that can transform thought into symbols that others can understand. The Red Umbrella Mixed Media Collage, originally uploaded by Scarlet_Beautiful. I chose this mixed media image as it summarizes many of my personal and professional interactions with text and technology. It seems like the young lady is seeking answers from the ancients in the horizontal script while new age pieces of data are falling upon her from above. Yet, given her attire (umbrella and rain coat) she is prepared to meet the challenges of meshing the old with the new i.e., creating synthesis. I believe I am beginning to find this place of synthesis with my old world skills and attitudes and my new age Web 2.0 abilities. I also find the juxtaposition with this transpiring out in nature to be a vivid reminder of our connections to the natural world and this is something we must never loose regardless of our reliance upon the new technologies. 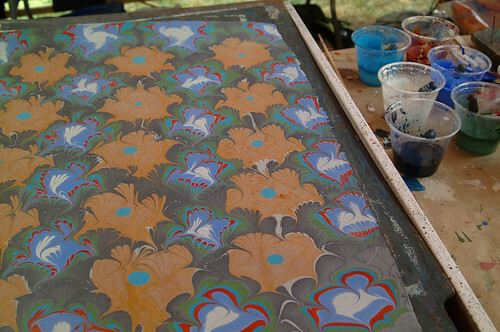 Paper Garden, originally uploaded by Smithsonian Institution. I chose this picture because it demonstrates that technology can be used to create something beautiful. Technology has been successfully integrated into many aspects of society, including the Arts, (textiles, paintings, sculptures, etc) and Humanities. Without the advancements of techniques, the different textures of the paints, the design of the paintbrushes, the construct of the medium, etc., this beautiful mosaic could not be made. Simple, yet beautiful. Technology does not have to be complicated. It can be simple, but at the same time sophisticated and elegant. I generally find that people make it more complicated than it really needs to be. Hi, my name is Deb Giesbrecht. I have been a nurse for 21 years. I work in Winnipeg and I teach nurses how to use computer programs within their working environment. Many nurses have difficulty with new technology, including computer programs that are designed to assist them in their daily tasks. My role is to support and educate them in this process. Electronic charting is a few years away, however, we are beginning to get nurses acquainted in using computers in their own work environment – which is challenging enough! I have recently implemented a Learning Management System, which allows learners to do online learning prior to face-to-face classroom time. This has proved to be challenging and enlightening all at the same time. This is my 4th MET course and I am looking forward to seeing what kind of positive impact this will have, not only to me personally, but also in my own classroom. I am always looking for new and varied ways to get messages across to the learner, and I have found that my previous courses in the MET program have equipped me with skills that I than pass along to the learners. I am eagerly anticipating what new skill set I will be acquiring this term! Computer Mountain, originally uploaded by draikar. When I saw this image of old hardware stored, the thought of how fast we run through different gadgets and fads immediately came to mind. It’s pretty amazing how “new” technology or technological artifacts become obsolete- giving in to something faster, better and simpler. I think that text has also gone through some transformations and stages, giving way to new delivery modes. I’m Cecilia Tagliapietra; I live in a small USA-bordering town in BC, Mexico and I decided to take this course because the title and content captivated me when I first read them. This semester I’m taking my 6th and 7th courses with the double degree program with UBC and ITESM; I’ll probably ask for a lot for help, since we’ll be working with new, different tools I haven’t had the chance to try before. I honestly hope I can learn from all of your experiences and comments. woven journal, originally uploaded by ereneta. The concept as text being like words woven together really made sense to me. This being my 8th class in the program, I am more drawn to different definitions of text than of technology. The relationship between language and meaning can be so complex, that it’s possible for text to be created merely for the sake of filling space without really conveying meaning. The picture effectively illustrates this possibility. My name is Ryan Bartlett and although this will be my 8th course in MET, it is my first course directly through UBC. I started the program 1.5 years ago while teaching foreign/second language methodology and EFL at a private university in Oaxaca, Mexico. Since then I have been taking courses online administered through the Tec de Monterrey in Mexico. So long story short, I’m excited to see how UBC works online not to mention very interested to take a deeper look at the complex relationship between language and technology.